Those were the lines I added to my very first video about cycling in the Netherlands exactly 5 years ago today on 9th January 2009. The first real traffic I see in the morning to get to work is usually a whole lot of people cycling. It was not an easy topic I chose to explain for a first video. There are a lot of conditions that have to be met before multi-modal commuting becomes a viable transport option. This involves the availability of bicycles for daily use, parking possibilities both at home and at the stations, good and safe infrastructure and so on. But as I have tried to explain in the five years that have passed since this first video, those conditions are met in the Netherlands. Now even more so than five years ago because cycling is booming in many places in this country and a lot has been done to facilitate it. Another milestone today: the video is the 300th video I publish. Two reasons to create a new version of the original “big commute in winter” video. Behind these blue fences was the bicycle parking facility that I used to park my bike in at Utrecht Central Station. Now a giant building site. 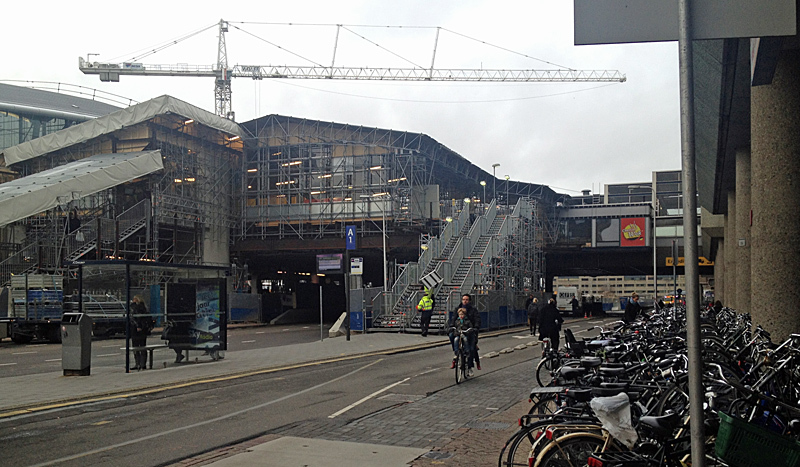 The temporary east or centre side entrance of Utrecht Central Station. My workplace and the location of my home have not changed. Nor has the way I travel to work five years on. Some things have changed though. I use a different bicycle. I retired my “English” Raleigh bicycle that I used in Utrecht and replaced it with my Dutch Batavus that was a lot older but still is in a much better shape. I previously had this bike in my home town, but since I got a new bicycle there, I could move my 29 year old Batavus to Utrecht. And it lives in a different place than my previous bike did. 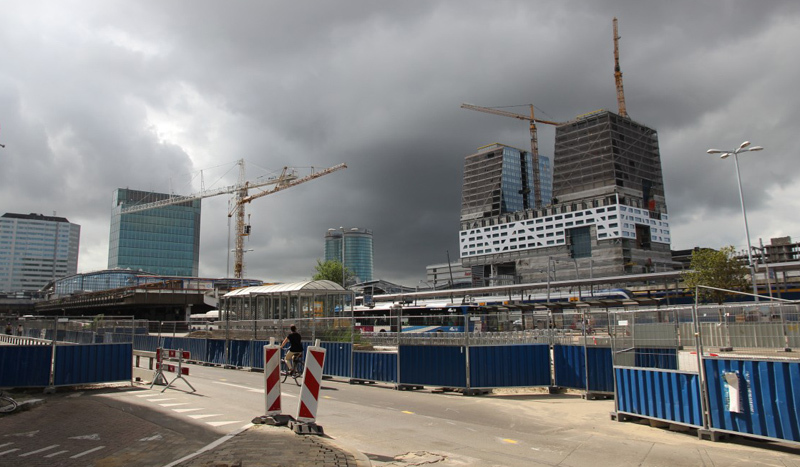 Utrecht Central station (and surroundings) is undergoing a massive reconstruction and that meant my old bicycle parking facility will be reconstructed and expanded to house 12,500 bicycles in future. They have closed the facility some time ago for this reconstruction. The temporary facilities are in a location that would mean I would have to walk further and cycle further. So I moved to a municipal bicycle parking facility just outside the railway station. This still means I have to walk further, but my ride is considerably shorter. It seems strange to use a bicycle for the remaining ride of only 800 metres. But I need the bicycle in Utrecht for many more reasons than just to get to work. I visit family on my bicycle and I also use it in the lunch break to quickly get to where I need to be. 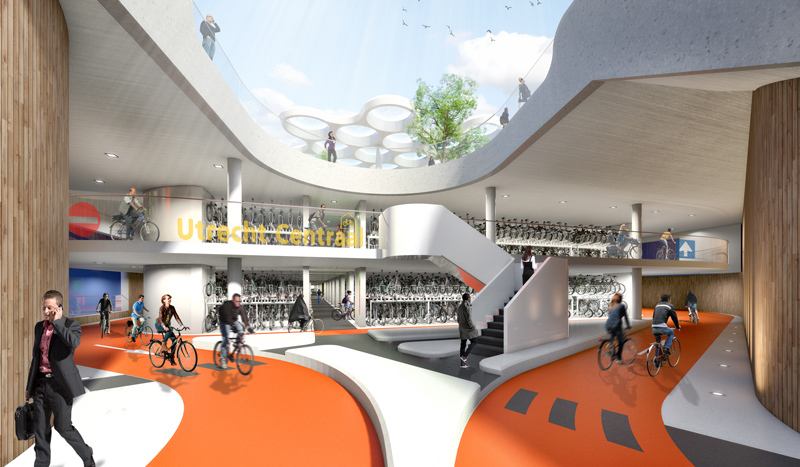 This will be the new entrance of the largest bicycle parking facility at Utrecht Central Station. 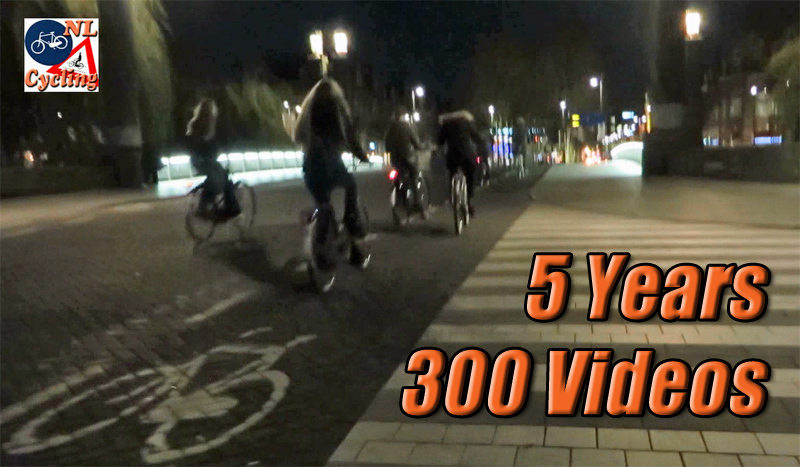 Since I first filmed my commute the main road between ‘s-Hertogenbosch and Utrecht was improved a lot. The difference between driving and using public transport is no longer so huge (driving used to take double or triple the time), but for this particular trip pubic transport still wins. It is impossible to drive the 50 kilometres in 50 minutes. Just getting out of and into the cities takes half that time. When the railways were building a new bridge last summer for which the train service had to be stopped for two weeks, I joined a colleague in his car and it took at least 30 minutes more every journey (so an hour a day extra). That also has to do with the fact that I chose my home close to the railway station. But it also shows that the Dutch really have the choice to use a transport option that suits them best. Nobody forces you into public transport or on your bike, but on the other hand circumstances do not force you to use a car either. All options have their own advantages and disadvantages, but they are all viable. You can really choose which is best for your own situation: a true freedom to travel as you wish. And as an added bonus: I am glad that with this commute of mine (that I have been doing like this for 18 years now) I get the daily physical exercise of 30 minutes as advised by the Dutch government and it doesn’t cost me any extra effort or time! My daily commute to work in the winter darkness. Most train travelers, 43% of the daily 1.2 million Dutch train passengers, arrive at a station by bicycle. (This figure is increasing rapidly.) They park their bicycle at the station and depart by train to another train station. To park their bicycle they either use free bicycle racks or they go for one of the paid options. Guarded bicycle parking facility (at about 100 stations): prices 2014 €1.25 per day / €13.50 per month / €103 per year. Personal bicycle locker: €109 per year (available on almost all stations without guarded parking facility). People who rent a bicycle (either a public transport bicycle (OV-Fiets) at 250 locations, or a normal rental bike) OV-Fiets prices 2014 €3.15 per 24 hrs (max. 72 hrs) and an annual subscription fee of €10. Normal rental bikes cost about €7 to €10 per day. In the Netherlands taking your own bicycle in the train is discouraged. Some things are simply not scalable. If almost half of the travelers in the train would be allowed to take their bike in the trains these trains would have to have many extra carriages for all those bicycles. Bringing a normal bicycle is therefore not permitted in rush hours (6:30-9:00 and 16:30-18:00), which makes commuting with your own bicycle nearly impossible. Folding bikes are an alternative solution, they can be taken as luggage. Outside rush hours, if the train is not too busy, nor an international train, a bicycle can be brought and you need a ticket for that bicycle. Day tickets for bikes are €6, regardless of the route. 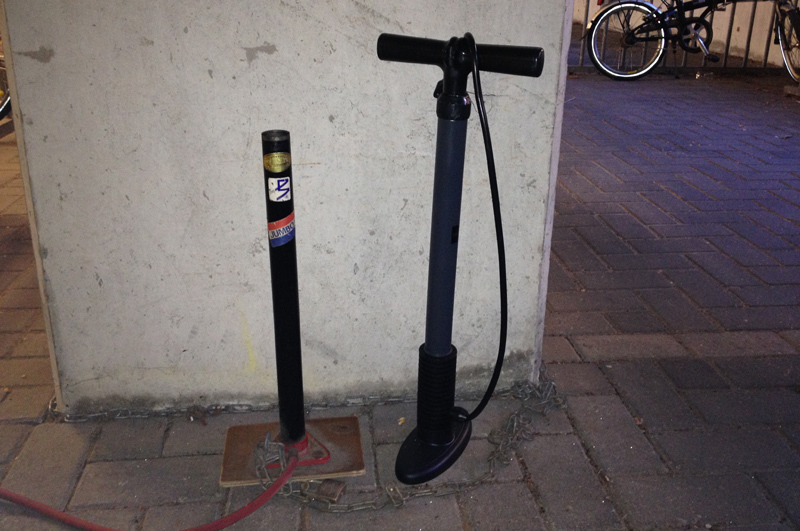 Old and new company bicycle pump. Hey Mark, how did you manage to break that pump. Also, did anyone break the new one since? Also, are employers responsible for paying you the cost of railway tickets/passes? After I cycled for 25 minutes, not hard racing cycling, I felt not to good in my stomach. Is this normal (I am aware you are not a doctor) in your opinion? I am new at this task, I don’t do it nearly as often as you do. Oh really? But would it be worth the trouble? It was a original Jumbo pump, made in Holland. Not a lot of Euro’s to replace..
With the principal difference being the question of scale, your post could have been writing about commutes of similar length into London from the “Home Counties”. From my home town, Haslemere in Surrey, about 3,000 people commute each morning into London. There is bike racking for about 70-80 bikes and I would say that at the moment about 60 bikes arrive daily (the facility was recently expanded so perhaps it is not surprising it hasn’t all been adopted yet). The racking is outdoor, but the security is satisfactory – either “Sheffield Stands” (a continuous steel tube about 50mm diameter formed into a rectangle and bolted into the ground at either end) or some new double-decker sliding racks. I would say that probably about a further 20 people – myself among them – carry folding bikes with them on the train. Although it is possible to take non-folding bikes on the train it can be difficult, as the available space on most commuter trains also serves as fold-down seating, and as space for large luggage, wheelchairs etc. You rarely see wheelchairs or pushchairs at peak times, but some passengers evidently prefer the fold-down seats to the normal seats and while the rail company policy is that cycle have priority for this space, that is poorly understood and arguments about the space could get unpleasant. The train time to London is a shade over 50 minutes. On arrival, many of those who left a bike at the home end will now turn to walking or public transport to complete their journey. A handful keep a second bike at the London end, on a facility with space for about 550 bikes. This facility was installed a few years ago and was, initially, fairly lightly used, but is now almost completely jammed – unfortunately, largely with bikes which almost never leave the racking and in some cases are visibly derelict, so denying space to other users. Before that, the static and derelict bikes were generally chained to lampposts and railings making a general nuisance of themselves. Anyway, at least some commuters opt for the two-bike solution either because they prefer a full sized bike or because folding bikes (principally Bromptons) while excellent, are very expensive. The alternative is the hire cycle scheme, or “Boris” Bikes. There are several docking stations close to waterloo station, and by 8:30am they are completely cleaned out, a few hundred bikes. The management company delivers additional bikes which are also snapped up very quickly. There is of course another principal difference: the vast majority of those multi-mode commuters are men, and the vast majority of them are under 50 years old. At neither end of the train journey can you say that cycling is a pleasant or stress-free experience. We have virtually no infrastructure – at best some painted lines which motor vehicles routinely ignore with impunity – and a culture in which it is apparently OK to threaten or abuse cyclists, and leniency is granted to motorists who go further and actually kill or injure cyclists. In this climate, you need balls (figuratively speaking) to ride a bike – nerves of steel, sharp wits, good physical fitness, and an assertive, perhaps even aggressive, approach to riding a bike. Really interesting to read that bikes are not carried at all on these trains at commuter times. The reason makes perfect sense, but unfortunately in the UK we would be short of somewhere to permanently (and securely) leave a bike long-term at the work-end. Officially we are allowed a couple of full-size bikes on most trains, and I suppose that applies even during the rush-hour but everyone knows it would be silly to try. Interestingly we don’t have any charge for bikes on any trains, although I often feel it would be better to have a small charge and more reliable provision for (more?) bikes, especially on longer distance trains. Congratulations with your five years of great work! Congratulations and thank you Mark. To average over one video per week for five years is an amazing effort and one that is very much appreciated. 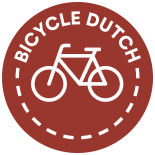 My dream is to one day make a video in Australia that will show the Dutch how to do something better for cycling and planning for people. Well…it’s more a fantasy than a dream. All the best for the next however many years you decide to keep writing and filming. This entry was posted on 9 January 2014 by Bicycle Dutch in Original posts and tagged ’s-Hertogenbosch (Den Bosch), commuting, cycle parking, ride, Utrecht.